Happy Thanksgiving from all of us at The Upstream Collective! 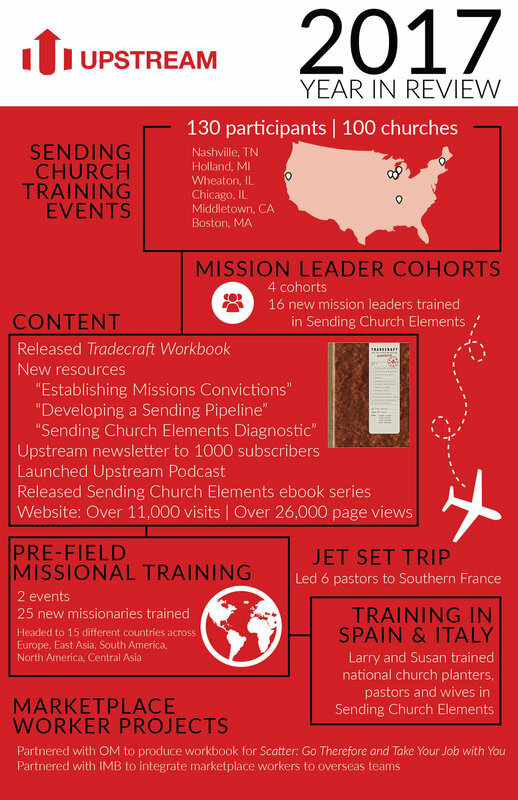 Check out the infographic below to see some highlights of how God used Upstream in 2017. Although the holiday is past, we would like to take a moment and thank God for all of our ministry partners, who have invested in our mission to help churches send locally and globally. We want to not only thank you but also continue to joyfully remember you in prayer. We have an open door at Upstream, and we want to know how we might serve your church. It is our joy to serve and provide resources to churches that have been overlooked as sending churches. Our capacity to do ministry and extend the influence of our resources and training is largely dependent and strengthened by your generous donations. As we come to the close of 2017, consider partnering with us through your year-end giving. Our desire is to see every church think of themselves as a sending church and for every believer to think and act like a missionary. Celebrate with us as we continue to remember what God has done this year. Newer PostAsk-a-Missiologist: Does Sending Church Exclude the Universal Church and Parachurch?